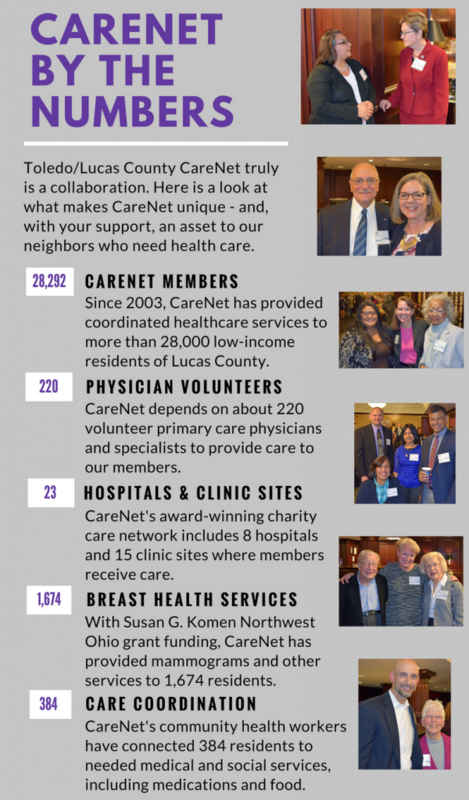 Toledo/Lucas County CareNet is participating in #GivingTuesdayNWO, and some clients are sharing their stories to highlight the work CareNet does to help care for our neighbors. CareNet is honored to have been there for each of them – and for all of our clients. Lois received help with expenses while battling breast cancer. Kathey was connected to medical and social services as she was getting her life back together after losing her job and home. And Jessica was a CareNet member when she found out a seemingly benign ovarian cyst was precancerous. CareNet could not have done any of this without the generous community support we receive every year. If you would like to donate to CareNet as part of #GivingTuesdayNWO on Tuesday, November 28, please use our secure online donation site. Andrea Vasquez and U.S. Rep. Marcy Kaptur. Dr. Arthur Mancini and Jan Ruma. Guisselle Mendoza McDonald, Erin Peterson and Theresa Gabriel. Standing, Dr. Timothy Sigman, Dr. Tina Jindal and Dr. Jay Jindal and, seated, Chinda Misra. Boyd Montgomery, Barb Petee and Katherine Montgomery. Bob Baxter and Sr. Dorothy Thum.